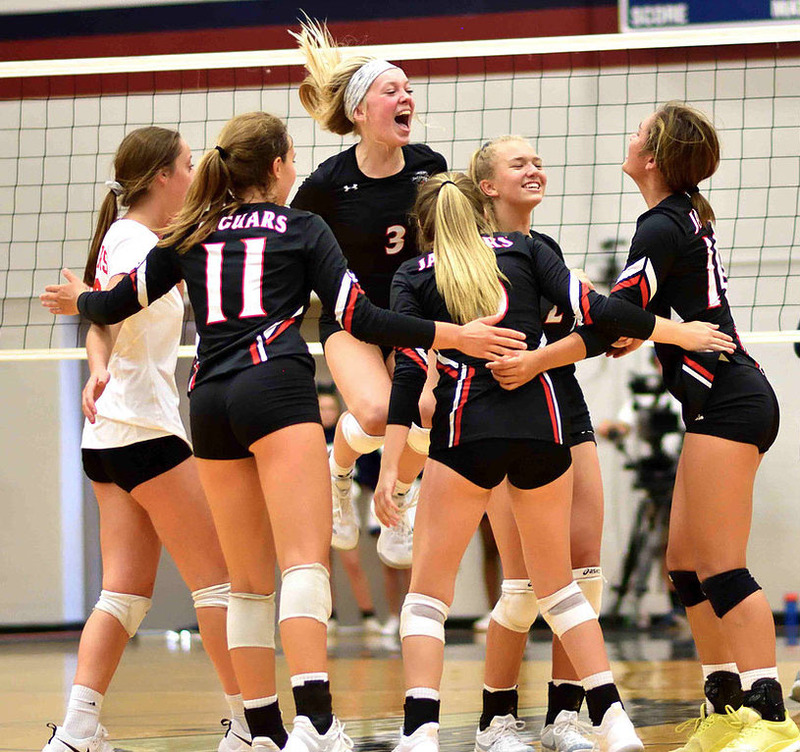 Showing excitement at the team victory against, Bishop Miege, freshman Ashlyn Berning jumps into the air. The volleyball team made an appearance in the last three State championship matches, winning in 2015. The team’s reputation for excellence and the expectations for team members are both great. Freshman Ashlyn Berning is the newest addition to the varsity team. Although Berning plays for USA volleyball as a member of the National Junior team, being the only freshman on the varsity team was more uncomfortable than she thought it might be. She is used to playing with girls in her age group and the seniors were girls she’d always looked up to. Playing without her friends made her feel more comfortable on the court and is the only freshman on varsity, making it hard for her to open up to the team. “It’s actually kind of lonely and I’m still not really myself with all the other members of the team.” Berning said. Berning was used to playing with girls her own age, even on the National Junior team. Playing with a new team and being a Jaguar was a lot to adjust to. ¨It is a huge privilege to be on the team.” Berning said. The experience of being on the USA Volleyball junior national team made her love for volleyball grow. Being completely emerged in the sport and playing it daily cemented her love for the sport. One of her favorite things about being on the USA team is being able to compete with teams from all over the world like Australia to Puerto Rico. Berning shared how much she loves to hear the stories about volleyball in different countries. “It was super fun to compete with people from Australia, Puerto Rico, etc… and they were also staying in the same hotel as us so we gotta talk to them about volleyball which was very fun.” Berning said. When an athlete has such tremendous success at an early age, people want to know how they got started. Berning has a clear understanding of where her love for volleyball originated. Berning played a member of the MAVS Mid-American Volleyball for several years but is transferring to a new club, KC power. The BV West varsity coach, Jessica Horstick, coaches for one age group and other Jaguar coaches lead others. Berning plans to continue playing volleyball throughout her high school years and hopefully college. With the skills Berning brings to the court and her tremendous love for the game should server her, and the Jaguars well over the next four years.